First, let me tell you that I adore Paco Underhill. 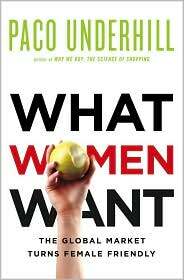 Then, I'll add that the entire title of his most recent book is What Women Want: The Global Market Turns Female Friendly. If you don't know Paco Underhill and his books, he's a market research guru, the founder and CEO of Envirosell, Inc., a worldwide company that works with companies such as Target, Trader Joe's Starbucks, Verizon, examining culture, shopping patterns, trends, and showing those companies how to reposition themselves to do better in the marketplace. Underhill's earlier books were Why We Buy: The Science of Shopping and Call of the Mall. These were important books, and businesses took note, and many of them implemented his suggestions. As a woman, I'm hoping they pay attention to his new book. Underhill covers a great deal of ground in this book, from how hotels should be treating women, the changes in bathrooms and workout spaces to the dominance of women in social networking. He has an easy, accessible writing style. With this book, it's essential to read the introduction, where he explains why he's writing this book. Traveling around the world, he sees "The expanded cultural, social, and economic influence of women." And, in every speech he delivers, he says, "We live in a world that is owned by men, designed by men, and managed by men - and yet we expect women to be active participants in it." Underhill believes those businesses that flourish will recognize the importance of women in the marketplace. As our recent economic problems have shown, women have kept their jobs, while more men have lost theirs in this recession. According to Underhill, "Approximately 70 percent of all American females work outside the home. Women control not just a percentage of active income in the world - i.e., money they take home from their jobs - but a large percentage of passive income, meaning family money, or money they've inherited." We dominate higher education; we're studying in the sciences. We've changed the way people shop for groceries with the organic movement. What do women want? Paco Underhill says women want cleanliness, control, safety, and considerateness. And, What Women Want points out that businesses flourish when they recognize that women want different things than men do, from cars to hotels to drugstores. There's a fascinating chapter about hotels, stressing that women travelers want clean rooms, good lighting and safety. Amen! I've always been fascinated by books about market research when they're readable. Paco Underhill's are my favorite. If you're interested in future trends, and where Underhill's customers will probably end up, thanks to him, you'll want to try What Women Want. What Women Want: The Global Market Turns Female Friendly by Paco Underhill. Simon & Schuster, ©2010. ISBN 9781416569954 (hardcover), 214p. It looks like someone has finally hit the nail on the head. We need more books like this to bring attention to the wants and needs of women. Thank you for printing this review. You're welcome, Bev. He does an excellent job explaining what and why women want cleanliness, safety, etc. I just really love his books, and his marketing research. I think a lot of companies should receive this book, Kris, to know why women are unhappy with them. Would love to send you a copy of my book, The Gender Intelligent Retailer, that I wrote with my co-author Joanne Thomas Yacatto two years ago. Be great to get your opinion on it let me know if you would like a copy.